What Are The Most Loved/Hated Features of Instagram In 2018? 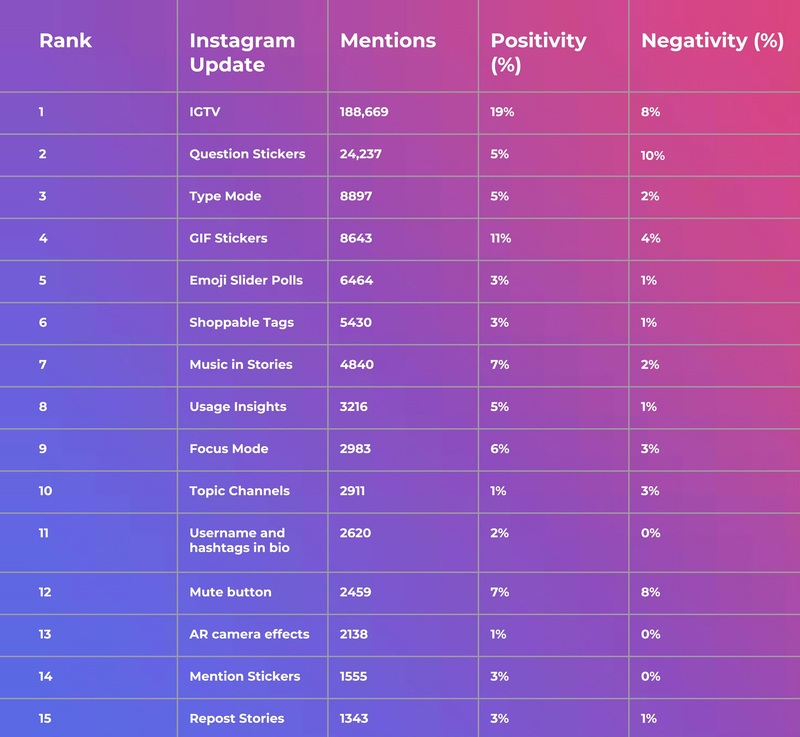 In an attempt to understand which updates and features on Instagram were the most and least loved by users globally, the team at SocialChain studied more than 250K tweets on Twitter. According to the SocialChain data, the Question Stickers were the second most talked about update. However, one might not mistake these statistics for the positive responses of the Instagram family. In fact, due to a lack of anonymity provided by this new tool, people were not very pleased by it, and therefore, recorded 10 % of all related tweets as negative. It was the IGTV which generated the most momentum. IGTV basically is a vertical video hub. It was a feature highly appreciated by social media users. It attracted many of the loyal content creators of YouTube and Snapchat. The management at the social medium reckons that there is little doubt that IGTV will prove as significant as other features, like the Stories. Although Facebook itself has been in hot waters due to various scandals, such as the Cambridge Analytica, it seems that Instagram remains unaffected by these developments. The popularity of the domain continues to skyrocket. Even though, the Stories feature in the application was inspired by Snapchat, it can be undoubtedly said that with the innovations Instagram has bought to it, the feature seems to suit the latter best!